A dispute involving several women at a popular clothing store in Philadelphia’s Rittenhouse Square mall on Friday erupted into a brawl that was recorded by other shoppers in videos that went viral, according to NBC Philadelphia. It was unclear what sparked the fight among at least five women who slapped, threw punches and yanked hair while falling over store displays around 3:20 p.m. inside Zara at 1715 Walnut St., according to the television news outlet. 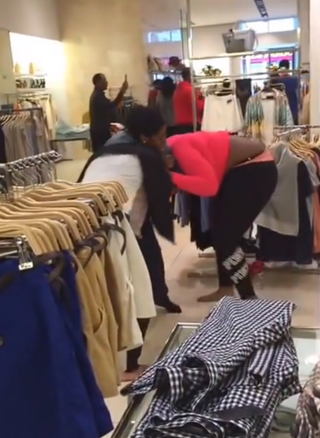 Some shoppers watched in apparent disbelief while others recorded the fracas on their cellphones and posted their videos to social media sites. “I just came here to get a suit,” one narrator says in a video posted on YouTube. A store security guard worked to break up the scuffle as employees called 911, notes the report. The crowd had dispersed by the time police arrived. No arrests have been made, and the incident remains under investigation, police said, according to the report.